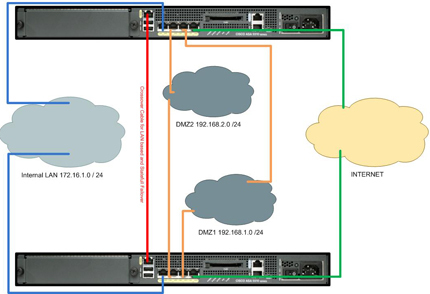 You want to deploy 2 Cisco ASA 55xx Series firewalls in an Active/Standby failover configuration. Hardware on both ASA firewalls is identical. The correct license’s for failover are installed on both firewalls. The same software versions are installed on both firewalls. You have your PRIMARY firewall set up and running correctly (Everything works!). In this example the firewalls were ASA5510’s and all interfaces were being used, so the Management port was used as the “Failover Link” (That needs a security plus license!). This Link will use a crossover cable (Only available after version 7.0(2) before that you had to use a switch – I think!). Also I’m using the same link for LAN Based failover (heartbeat) AND Stateful replication. Step 1 Carry Out this procedure on the PRIMARY (Already configured and working) firewall. 1. Backup the running config on the primary firewall. 2. Blow away the config on the interface you are going to use for failover. 3. Change the interface IP addresses – (to add the standby addresses for each interface). 4. Set up the failover LAN interface (In config mode!). 5. Setup failover link IP address. 6. Setup a shared key. 7. Set it as the primary firewall. 9. Now we need to enable stateful failover. Step 2 Carry Out this procedure on the Standby Firewall. 11. Enter enable mode . 12. Clear the configuration on the failover interface (Management 0/0 in this example), then open the failover link and issue a “no shut” command. 13. Turn on LAN interface for failover. YES: that’s the same as the primary firewall there WON’T be a conflict). 15. Give it the same key you used above (In step 6). 16. Set it as the secondary (standby firewall). 19. When is says that is has ended replication On the secondary firewall, issue a “show failover” (Note: the hostname will have changed to the one on the primary firewall). 20. To double check go back to the PRIMARY firewall and issue the same command. 22. Save the config. (Note: config changed WILL be replicated to the standby firewall). 23. When done pull the power on ASA 1 to fail. With a constant ping running you usually will only lose 1 ping packet. Note: This assumes you have already added ‘standby’ IP addresses to all you interfaces and is using GigabitEthernet0/4 as the failover interface. Change the values in bold to match your requirements.